I started a thing about two years ago now. Every Thursday night is Family Dinner Night (FDN) at my house. There's nine of us including me and my husband, my mom and dad, my two daughters, my son-in-law and my two precious granddaughters. We have a blast! I look forward to Thursday every week for a couple of reasons but the top reason is FDN. I plan and cook the meal all by me little lonesome. For the past few weeks, I've been focusing on soups. The weather is a bit cooler and soup just seems to be a Fall food. Tonight we had lasagna soup. I found the recipe at A Farmgirl's Dabbles. This is her photo. I always forget to take a picture of new recipes. Well...not always but I did tonight. I used fusilli pasta I got at Kroger. I followed the recipe almost exactly. The soup turned out nicely. Quite delicious and overly satisfying. The guys in my fam really enjoyed it. My husband and son-in-law had seconds. My son-in-law even agreed to take some home for lunch tomorrow. SCORE! 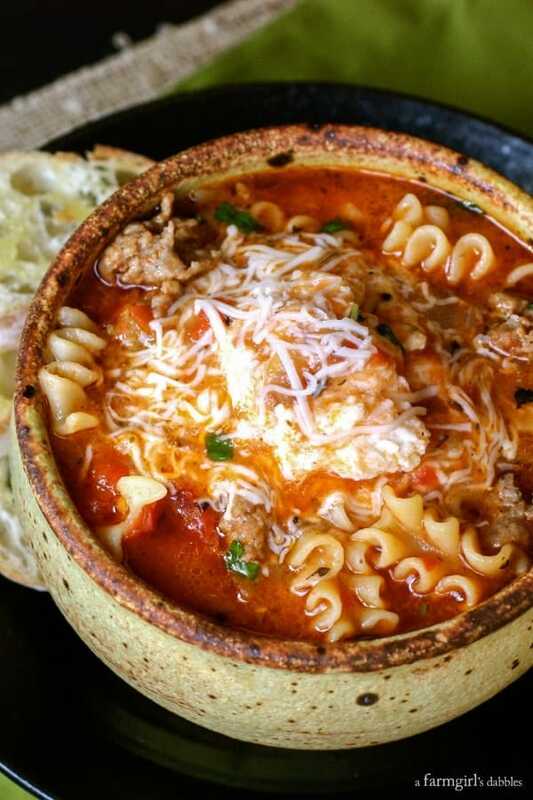 Lasagna Soup is a definite "must-try" recipe. Oh and I followed her tips on the recipe also.